Have you had a boat moved by us recently? How did everything go? I contacted Great Lakes on short notice after having another company fail to provide professional service. Chris was on top of everything from the start and had my boat picked up within 4 days. Once my boat was picked up I was in direct contact with Lenny who provided me with nightly updates. Once my boat was at the marina Lenny did everything he could to assist me. He helped with fueling the boat, launching and even docking it. With me being new to a big boat it was awesome to have a experienced professional willing to go above and beyond his job scope. Lenny and his fiancé also helped me put my canvas Bimini on and and troubleshoot several issues with the boat. All of this was done during the Christmas holiday so I’m extremely happy to have the boat and to have worked with amazing professionals who enjoy what they do. There is no question to who I will use in the future and who I will refer people to! Thanks for your help in getting our boat from Port Townsend, WA to Media, PA. Gene did a great job for us. The boat arrived this morning as promised and in great shape. 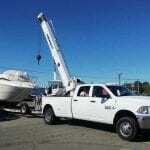 We are very impressed Great Lakes Boat Haulers and No Limit Transport. We wanted to extend our Thanks to everyone there that helped us get our 2003 Formula 330 SS back home to Monroe, MI safely. Brett was great. We appreciated his attention to every detail and his kind, fun personality! 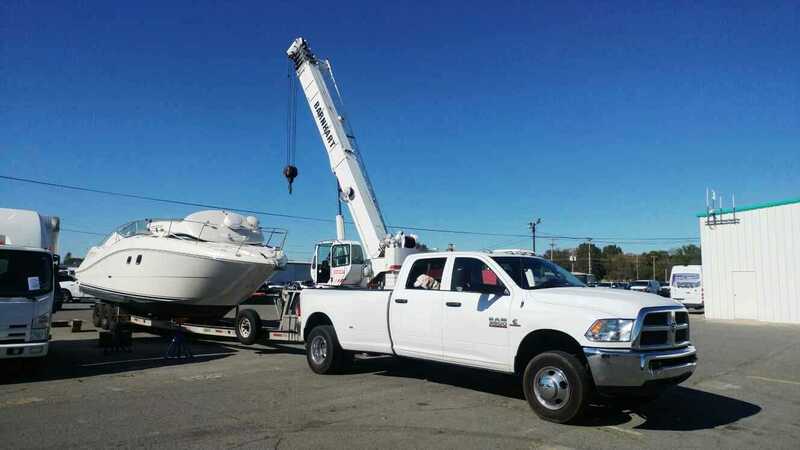 Chris, We could not be more happy with the service provided by Great Lakes Boat Haulers. Britt was truly a gem to work with. He kept us informed with every leg of his trip hauling our new boat from Kentucky to Michigan. Thank you for a great job, and if we ever need another boat hauled in our future, we will be sure to call you. I was pleased with YOUR transport of my vessel. Although, the marina in Jeffersonville In. was very difficult to work with. Your driver was on time and ready to load, but unfortunately THEY were not. He was delayed hours, due to neglect on THEIR end. Several phone calls made to THAT marina went unanswered during this long delay. Meanwhile, I was in direct contact with your driver, confirming there neglect and actual harassment! Eventually the owner of the marina arrived to actually load my Sundancer, it was secured well by your driver and delivered with my satisfaction. I was very pleased to see it pull in to Bay City Mi. at the Pier 7 Marina. Thank you for the call from the driver to let me know the arrival time. It was a pleasure to have met you in person, and if your services are needed again, I will be using your company. 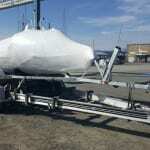 Thank you so much for your help and cooperation in shipping the Boston Whaler from Michigan to Florida. You were a pleasure to deal with and your driver and equipment were first class. I look forward to working with you in the future. President, Cedar Ridge Boat Works, Inc. Perfect!! Thanks so much for all your help and understanding, driver was great!! Would recommend to anyone!! I just wanted to thank you for your help and effort scheduling transport of my boat. Your flexibility yesterday was great. We ended up doing the wet launch because my marina was closed for the day. Things went great. Sorry for the delays by the marina at pick up location. I’d recommend you in a heartbeat. Chris, I would like to thank you for the prompt and professional service you provided to my division. The whole process from quote to delivery was flawless. 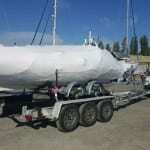 If the opportunity arises again for use of a long distance boat hauler I would definitely contact you again for a quote. The driver Steve McIntyre was great and very helpful. Once again thanks for your professional service. 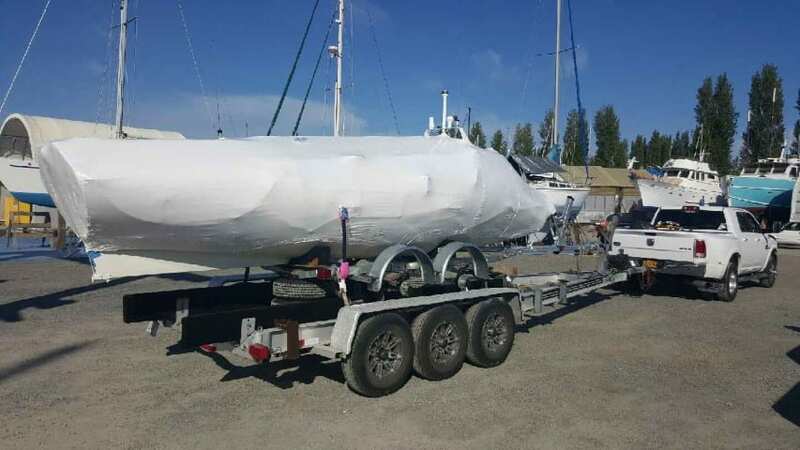 I received my boat on Saturday morning, earlier than expected which was appreciated. I had a very disappointing experience with ********* Transport who didn’t tell me they decided not to pick up my boat and then when I called numerous times, refused to pick up my calls which was completely unprofessional and infuriating. Your company was professional, polite, caring, reasonably priced and kept me informed throughout the process. I especially appreciated the photos you sent at time of pick up as well as the calls to inform me of status and changes(earlier drop off) throughout the process. Top notch service and I would absolutely call you again when I’m ready to move my boat. Everything went perfect. Your driver was the best. He was very helpful considering we have never done this before. I want to thank you for all your help. When the boat sells, I will be sure to recommend your services. And if I have any more like this I will be sure to call you. Thank you very much, Pam and Chris! It was a pleasure working with you all, too. Looking forward to recommending you to our future customers. Just wanted to drop a note that my boat arrived safe in south Florida. Gene did a really good job and was in communication along the way. Definitely recommend. This is only to say THANK YOU for getting our trailer to us last week. Your driver, Gene, was extremely helpful as he was always available anytime I needed to reach him. He is a very personable young man and we truly appreciate all he did for us. Thank you again, sir, and I trust you and Gene have a long working relationship as he is a fine young man. Chris, I am writing to let you know how pleased we were with the shipping operation you arranged. Gene did an excellent job. He stayed in touch with us along his trip from WI. He arrived at the pick up ahead of schedule and had the boat unloaded at JBM four hours early. He was very pleasant to deal with and did a great job of securing and protecting our prized possession. 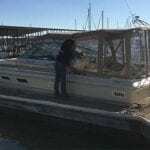 I would recommend both you and Gene to anyone needing boat hauling service. Thank you again for arranging this on short notice. We were thinking of having our SeaRay 300 hauled to the Traverse Bay area next summer. Now that we know what a pleasant experience it can be we are very likely to make that move with your help. Pam and Chris,I just wanted to let you know that Britt did an outstanding job today hauling my boat from Harrison Township to Grand Haven. He was a pleasure to work with. He called me this morning to confirm plans and locations. He consistently had safety as his top priority followed by making sure my boat was not damaged. He communicated clearly throughout the trip and arrived in Grand Haven as planned. I really appreciate the excellent service the two of you and Britt provided and will definitely recommend your company to others.Thanks. We loaded this 1971 Thunderbird 30′ houseboat project boat at Starved Rock Marina Ottawa Illinois to owners residence Warrenville Illinois. She was lifted off with a crane and the owner wrote the following thank you. I got as lucky as lucky gets. This was a much more difficult job than I thought, and thankfully you sent the 2 best men to pull this off. I thanked my luck stars before I went to bed last night knowing so many things could have gone wrong and didn’t. Wayne and Frank pulled off a small miracle. We had an outstanding experience with your company. 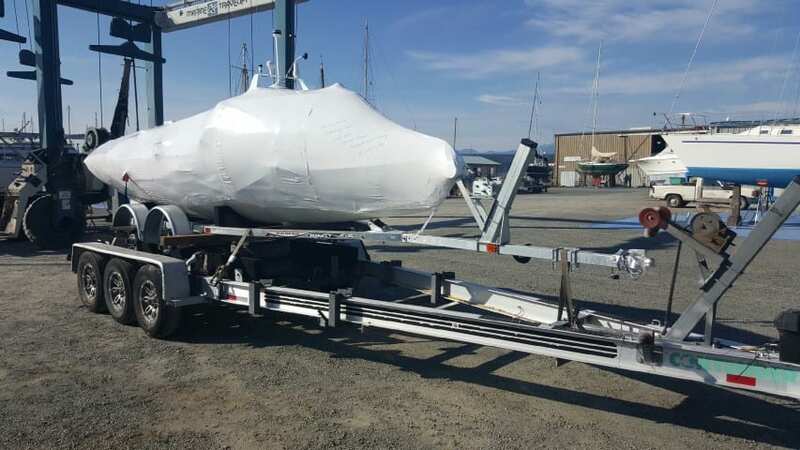 We were extremely frustrated trying to get our sailboat transported from Maryland to Michigan, with several cancellations by another hauling company. After four months, we finally called you and you had a driver there in two days! The driver was very professional, and he let us know exactly when he was going to get to the marina. After careful loading, he drove overnight to Michigan, arriving in the morning and helped to get the boat unloaded and safely on a trailer. We couldn’t be more pleased, and will definitely use you again should the need arise. Thank you! We are very satisfied with the delivery of the boat. Pickup and delivery were on time as stated, and trouble free from my perspective. I would certainly recommend Great Lakes Boat Haulers. Morning Paul! Was just in the middle of emailing you and Chris to let you know what a true delight your driver Gene is and what a wonderful job he did delivering my boat. 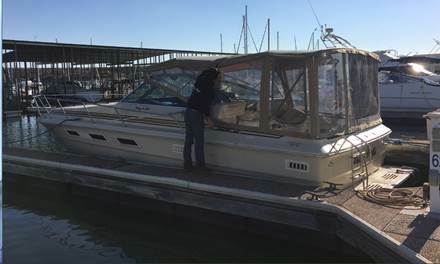 He patiently went over every detail of the boat and handled all aspects of getting it settled in at the marina. There was a cushion missing on the back rear seat, so he smartly took pictures of that to make sure the previous owner knew it was missing before departure. Don’t think you could ever go wrong having someone as clearly responsible and careful as Gene is, handling anyone’s boat, be it large or small. Thank you for making sure it got here so quickly. That was terrific and I hope it will be in the water in a couple of days for at least three or four weeks. I wanted to say thank you very much for providing such a great service. The driver kept me informed the whole time and was very patient and helpful launching the boat. Again, thank you, and I’ll definitely use your services again and recommend your services! I wanted to shoot you guys an email and personally thank you for all of the assistance during the process of our boat purchase. You all were so flexible and kind during the whole transition. There are a lot of moving parts to line up in the purchase process and I appreciate your patience. The driver was very friendly and helpful. It was a seamless process unloading the boat, and I am grateful we were able to do a water launch. I will definitely refer your company to other boaters! Please pass this message along to Chris, as he was always very friendly in the conversations I had with him as well. My name is Stacy Bright and a few weeks ago you moved a boat for me, a 1973 36′ Allied Princess from Lake Orion to Rochester Hills. We greatly appreciated the service but really wanted to say a great thanks for todays service. When we moved the boat the driver was unable to move the masts (main and mizzen) and the booms. We ended up having Lenny move the masts for us today and we could not be happier with the service we received. He was courteous and professional and made the move so easy.